The amount of condition-sensitive cargo is growing due to tailored pharmaceuticals, increased demand for fresh produce and more last mile deliveries (grocery and restaurant). The logistics and packaging have improved for condition-sensitive cargo and the desire for real-time information has become a requirement for most cold chain shippers. Now, it is time to implement IoT solutions to maintain the quality throughout the cold chain as well as comply with existing and new regulations. Download our new whitepaper for an in-depth look here. In controlled environments, such as the lab or warehouse, it is easier to maintain and monitor the correct environmental conditions. When traveling or at the final destination, however, there are any number of reasons that a breach can occur from a disabled truck to a pallet getting wet before loading onto a ship. These situations are where technology becomes important in preventing or correcting an issue. It saves you time and money from having a rejected shipment as well as product damage and loss expenses. 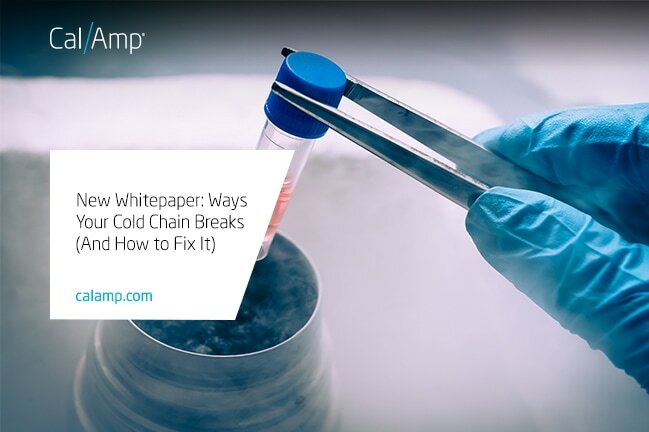 To learn more, please download the latest CalAmp cold chain whitepaper here. If you would like to discuss this topic in person, the Supply Chain Integrity team will be at LogiPharma on October 4-6, 2017 in Philadelphia. We are proud to be a sponsor of this event.